Chop mangoes finely add the mangoes,sugar & cardamom in a blender. Make a smooth paste.Do not add water while grinding. If your mangoes has more fiber strain to get a smooth puree. 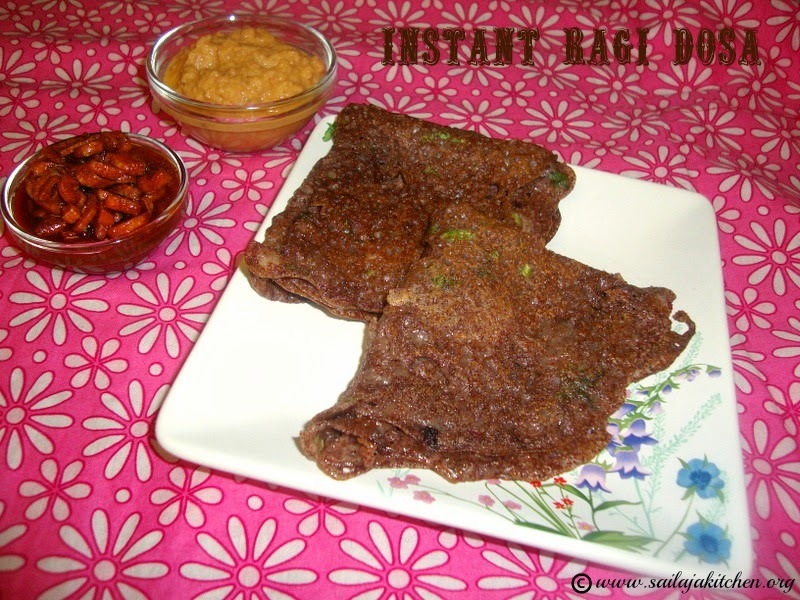 Grease a plate with ghee or oil spread the puree evenly.The layer should be a thin spread. Dry this in sun for a day,next day slowly peel the sheet turn & dry the other side too. Usually these tandra takes 3 days to dry. Slowly peel it off the plate cut into desired shapes & enjoy! a) You can also cook the mixture for 1 or 2 minutes on stove & then spread it on a plate for drying. b) For spice version just add some chilly powder,ginger powder & black salt to the above mixture. c) Store it in fridge. d) Use any kind mango but sweeter the better. e) Some make this recipe with store bought pulp,but i have not tried. Soak the rice for 3 hours.Drain out the water & put it in a blender/Mixi. Grind it with very little water to a smooth semi thick batter. Make sure you don't add too much water while grinding,you can always add later if its thick. Add salt & jeera to the batter & mix. Steam these leaves for 2 minutes till the leaf colour changes & your vadams are cooked. Cool for a minute & gently peel them off . Spread a clean white cloth & place these steamed vadams on them. Dry them in sun or inside the house with fan on. Dry them completely & store them in a container. Deep fry them in oil & enjoy. 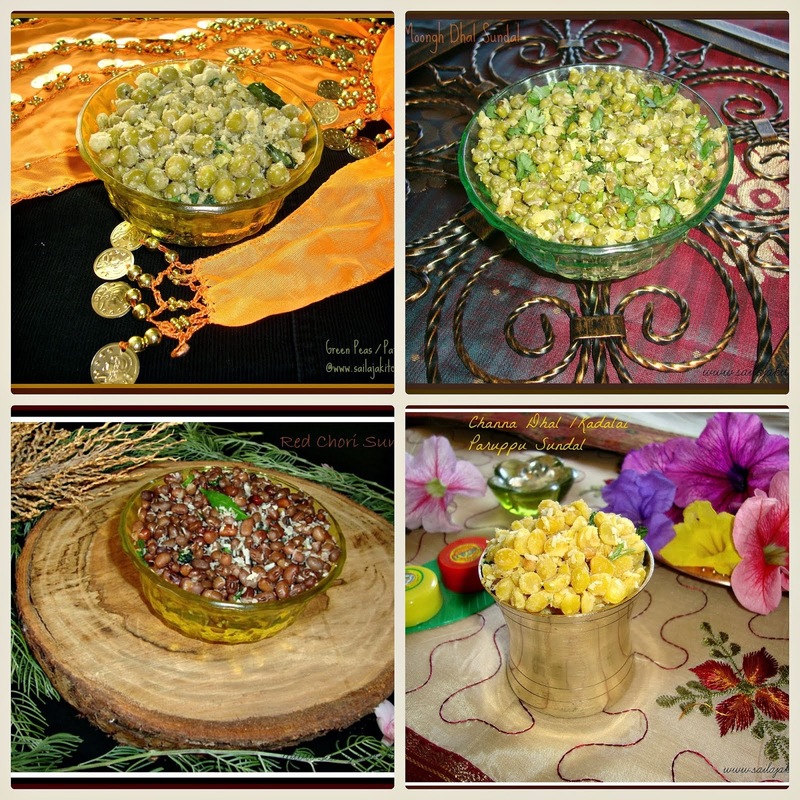 a) Hing & ground green chilly paste can also be added.Jeera can be replaced with ajwain. b) Batter should be slightly runny than dosa batter. 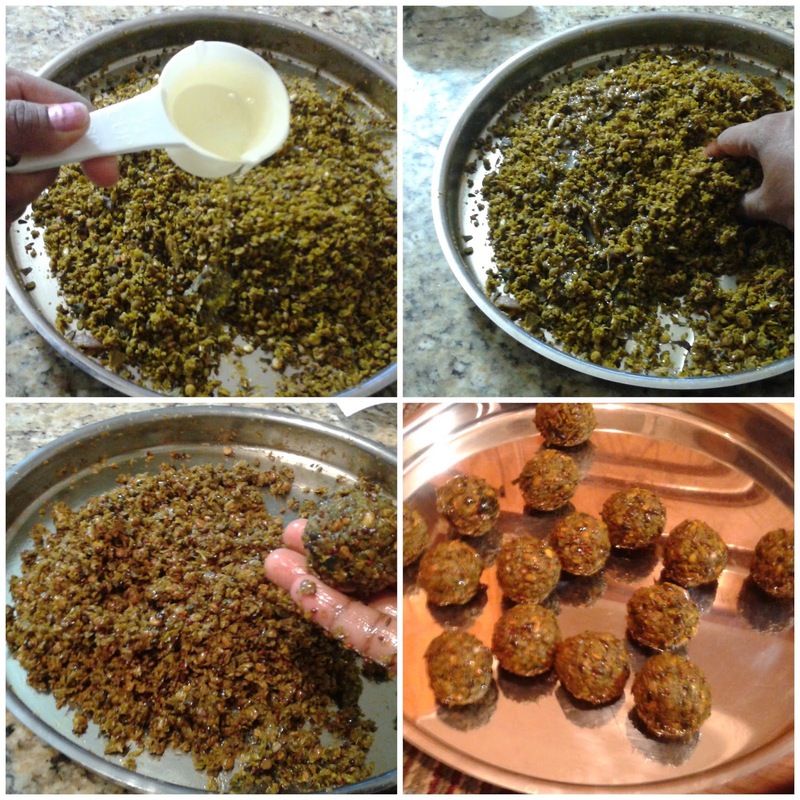 c) Do not grease the leaf with too much oil then you won't be able to spread the batter evenly. d) No need to ferment the batter for this vadam. Wash and boil the potatoes in a pressure cooker till soft. Cool & peel the skin,now finely grate the boiled potato make sure there are no lumps.I got around 3 cups of mashed potato. Take a bowl add the grated potato,red chilly flakes,salt & jeera,Mix well to make sure everything is well combined.Divide the portion into 22 small balls. Take a plastic sheet grease it with oil place a potato ball keep another sheet on top & gently roll it out to a thin papad. 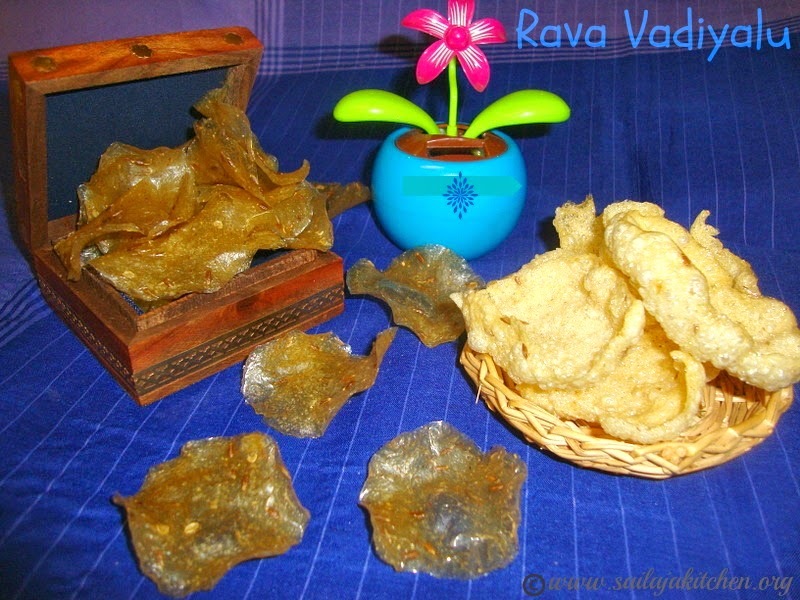 Remove this & place it on a big plastic sheet & dry it in sun for 2 to 3 days or till they are completely crisp dry.After one day i turned all the papad other side. Store it in a container & deep fry in oil when needed. a) If you don't have a grater then use your palm to mash the potato.Make sure there are no lumps then rolling will be difficult. b) Chopped coriander leaves can also be added to the mixture. c) Do not cut & then boil that way the potatoes will absorb too much water. Take a wide plate or bowl,add all the above ingredients. Mix everything well to make sure the vegetable is well coated. Cover & leave it overnight.Next day spread it on a plate or tray and keep it in sun. Keep them for 2 to 3 days or till its crisp dry. 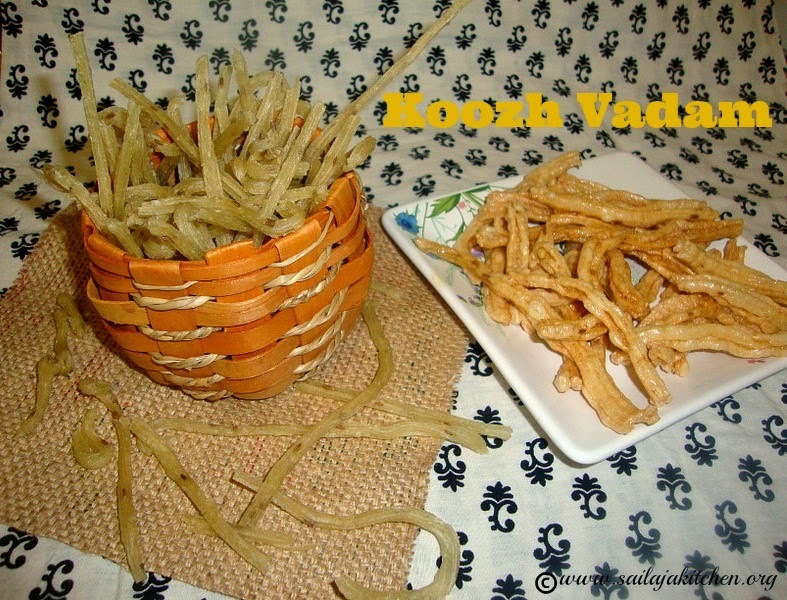 Store them in a container & deep fry these vathals in oil when needed. This goes well with sambar rice,rasam rice or curd rice. You can also deep fry & add them to vatha kuzhambu or mor kuzhambu. Wash & soak lobia & urad dal separately for 7 to 8 hours or overnight. Grind red chillies,salt,hing & curry leaves to a smooth paste. Grind lobia & urad dal separately to a thick batter.Do not add water while grinding,sprinkle if needed.The batter should look like a vada batter. Add the mustard to the ground paste & mix everything well till well combined. Spread a plastic sheet in the sun. Dry this in sun for 2 to 3 days till its crisp dry. Deep fry in oil & add this to kara kuzhambu. Boil water with salt,turmeric & tamarind. 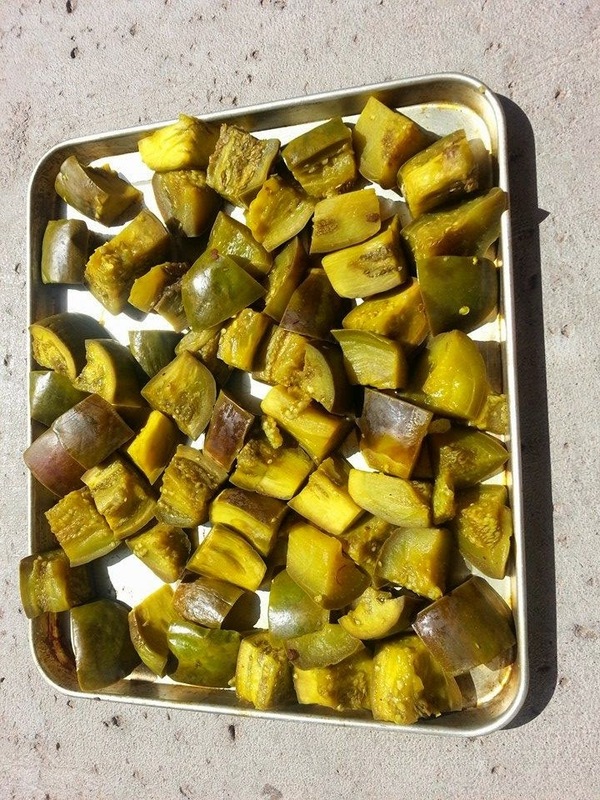 Cut the brinjal into medium size cubes. Add this to the boiling water,reduce flame. Cook the brinjals for 2 to 3 minutes,do not cook them too long. 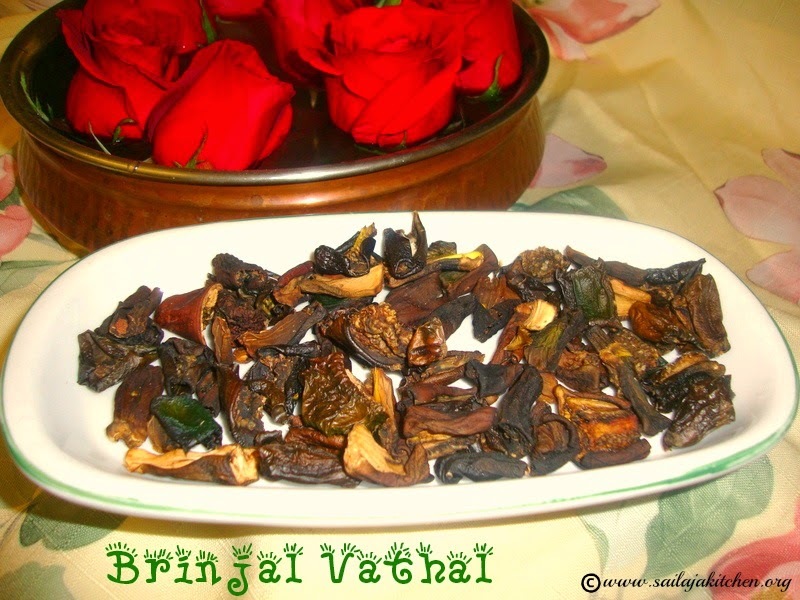 Once the colour changes & just cooked remove the brinjals from the water & discard the water. Spread them on a tray or plate,dry them in sun for 2 to 3 days. Once the brinjals are completely dry & crisp store it in a container. Fry these in oil and add while making kara kuzhambu or sambar. 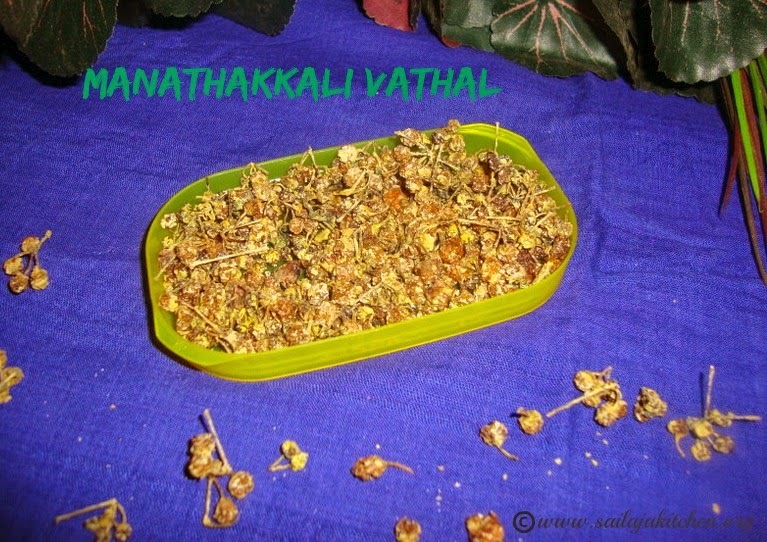 Manathakali Vathal / Manathakkali Vathal Recipe - How to make Manathakkali Vathal At Home. Soak all the ingredients together in a bowl.Leave it overnight. Next day spread it on a plate & dry them in sun. Dry them completely till all the curd as absorbed the seeds & are dry. Store them in a container. Fry in hot oil when needed & add it while making vatha kuzhambu. Finely chop onion & crush the garlic.I used a food processor to chop both. 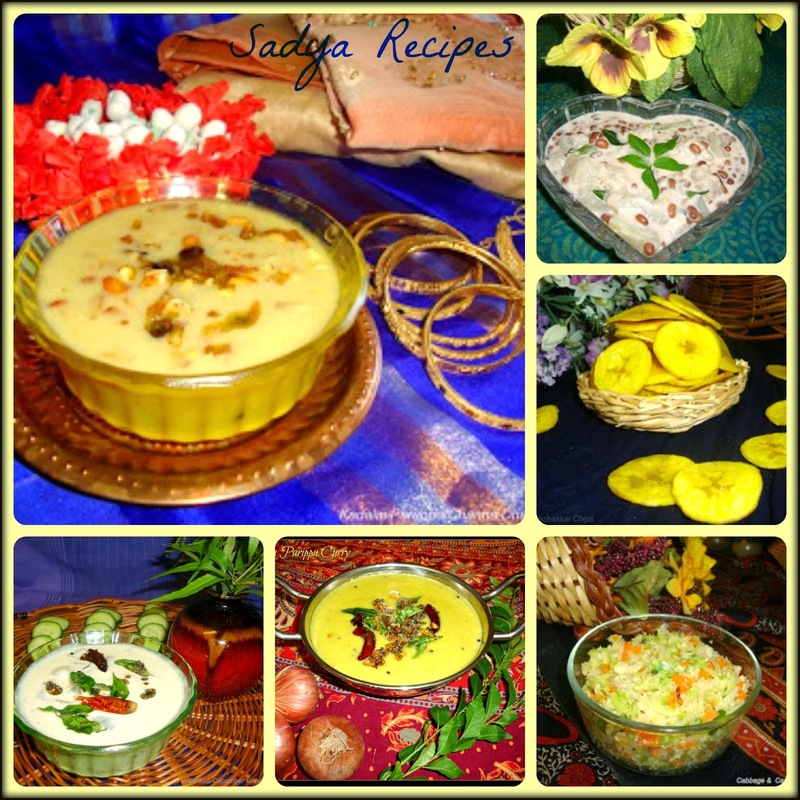 Soak urad dal in little water for 30 minutes & drain the water out. Take a wide bowl or plate mix all the above ingredients except the oil. Keep this mixture covered for 1 day at room temperature. Next day dry this mixture in sun for 2 days,on the 3rd day add the oil mix it well. Shape it into big lime size balls & dry it again in sunlight. 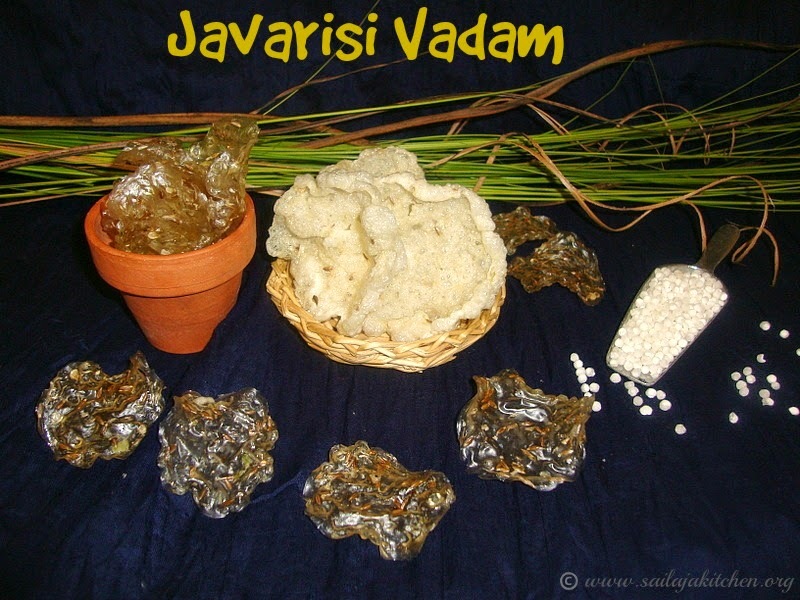 Dry these vadagam till its completely water free,crisp & dry,this takes around 4 to 5 days. 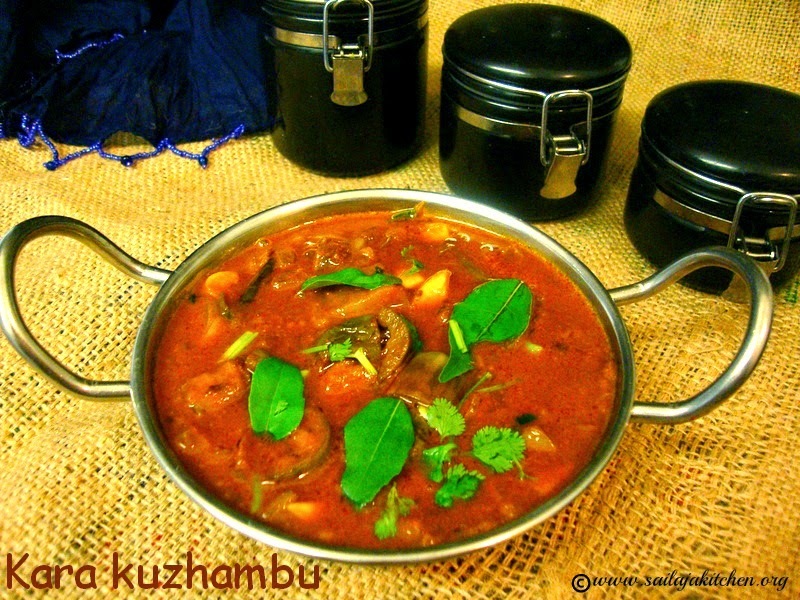 Store them in a container & use them for tempering while making sambar or kara kuzhambu. 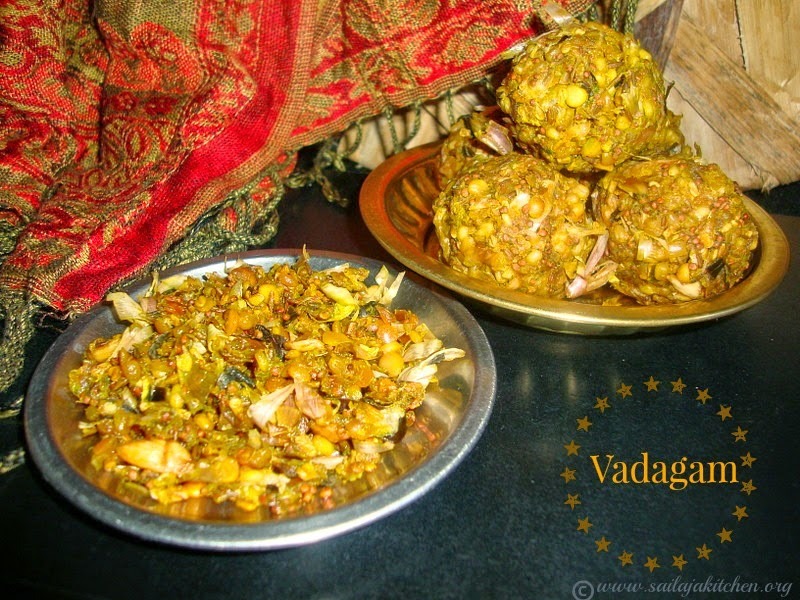 a) Usually only small onions are used for making vadagam,but i have used big onions. b) Drying is faster in loose form. c) This is usually used in tempering when making sambar,thuvayal & kara kuzhambu. d) Drying process can take up to 10 days or so. e) I felt sesame oil gives nice flavour to the vadagam. f) Some people grind the urad dal to a coarse paste & then added,this gives binding for the balls. g) I used sesame oil in this recipe,My grandmother used Castor oil those days. h) I got around 10 medium lime size balls for this above quantity. Peel the potato & cut into small thin slices like we cut for making potato chips. Immerse all the potato slices in water. Wash the potato twice to remove starch from the potatoes. Boil some water add salt & alum,add the potato. In medium flame boil till its 1/2 cooked. You should be able to tear the slice,then this is the right time to switch off the stove. Rinse this 1/2 cooked potato in fresh water twice,drain out the water. Spread these potato slices on a cloth. Dry these in sun for 2 to 3 days till the potatoes are completely dry & crisp. Store it in a container & deep fry when needed. a) Do not over cook the potato. 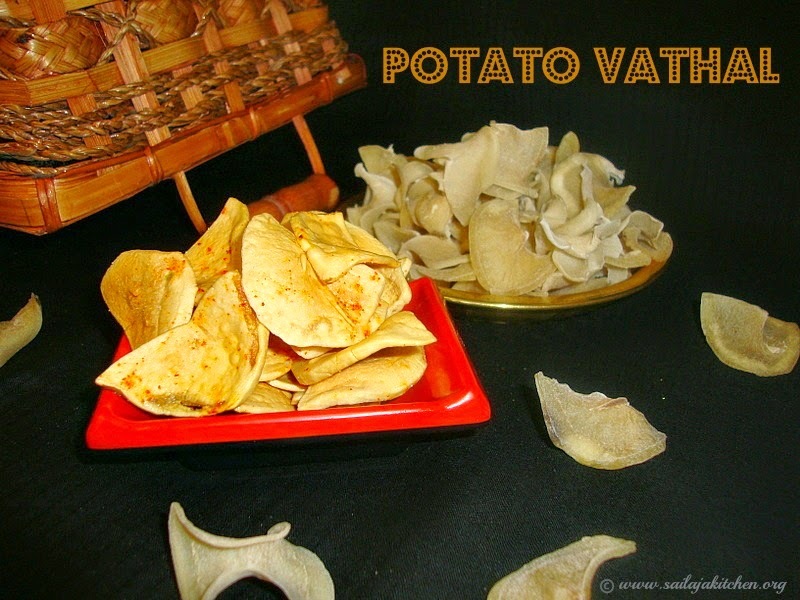 d) After deep frying sprinkle salt & chilly powder on top & enjoy the potato vathal/chips. Cut the bitter gourd into semi thick circles. Boil water with salt & turmeric powder. Add the cut bitter gourd & in medium high flame boil till its 3/4th cooked or for 5 minutes. Switch off the stove,drain out the water completely. Spread these semi cooked bitter gourd in a tray. Dry these for couple of days in hot sun till its crisp. Deep fry in medium hot oil when needed. Can be eaten with sambar rice or add it to Puli kuzhambu. Grind ginger,green chillies & salt to a smooth paste. Boil water in a heavy bottom pan add the jeera & ground paste. Reduce the flame & add the rava ,stir it continuously to avoid forming of lumps. Cook this mixture till rava is cooked & its slightly thick. 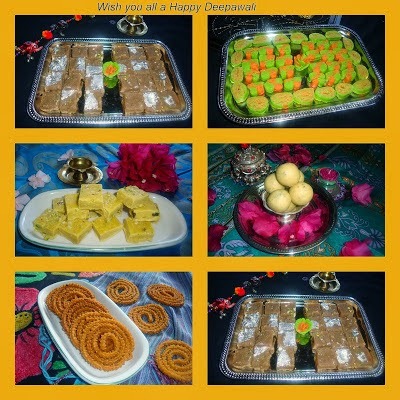 Switch off the flame,while still warm spread a plastic sheet & drop a spoon full of batter & spread.Do not spread it very thin. Dry these for 2 days or till its completely dry & crisp. Remove from the sheet & store them in a container. 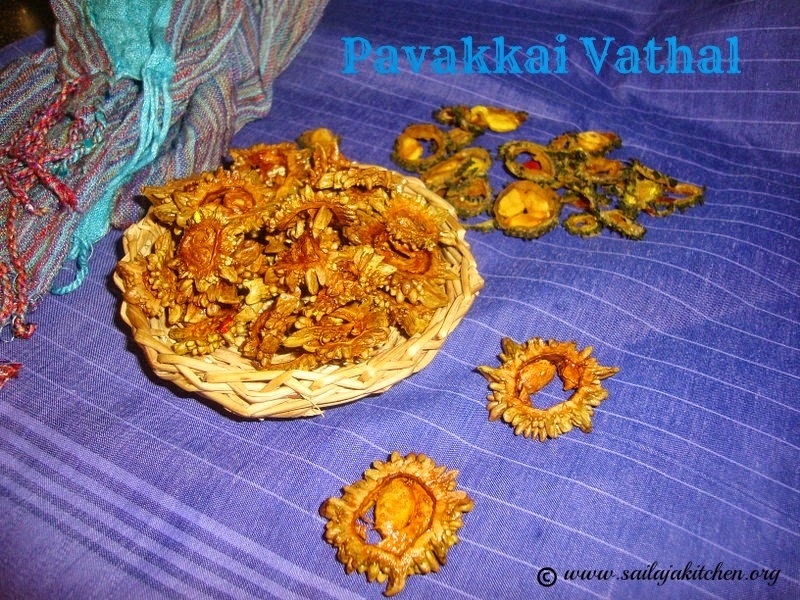 Deep fry these vadiyalu/Vadam in hot oil & enjoy! Wash rice & sago together,pour water just above the rice & leave it overnight. Consistency should look like a semi thick dosa batter. Boil 3 cups of water in a heavy bottom pan,add the jeera now reduce the flame & pour the ground mixture. Keep stirring constantly in medium low flame , cook till the mixture thickens & no lumps formed. Wet your hands take a small ball from the mixture to check if cooked.The dough should not be sticky & its easy to roll like a ball then your dough it ready. 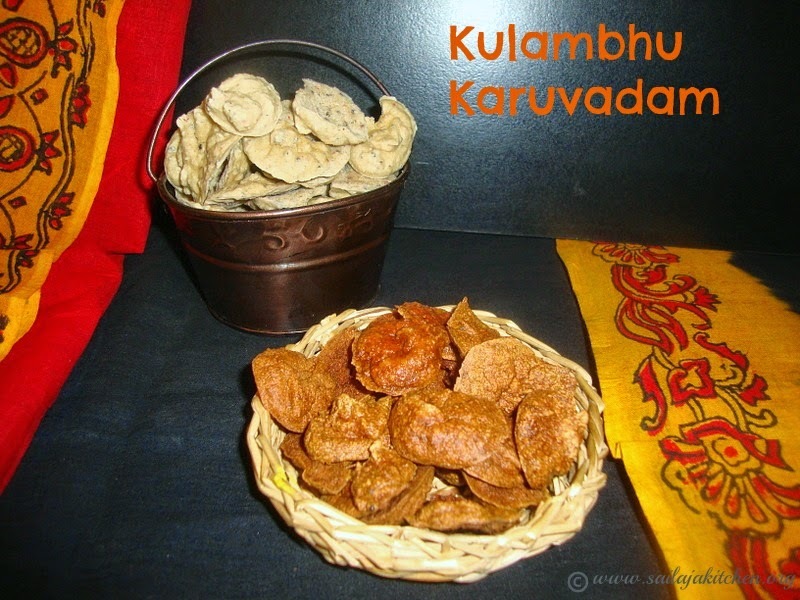 Fill the murukku press with the dough,i used single star shaped plate. Squeeze it out directly onto a wet cloth or on a thick plastic sheet. 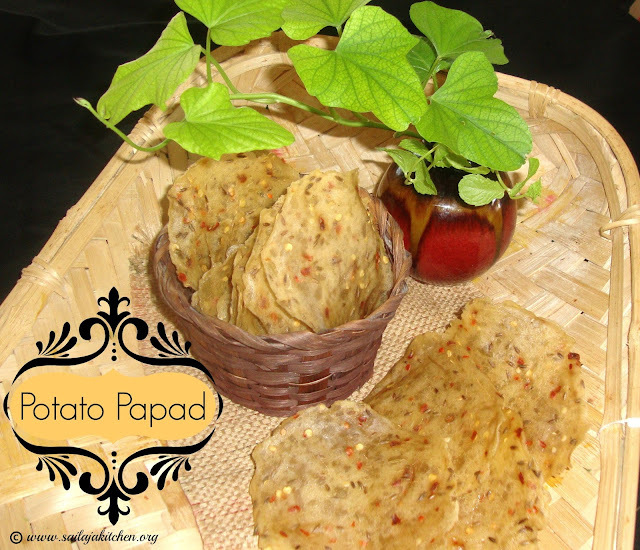 Dry it in hot sun for at least 3 days,then peel it out from the sheet & dry till crisp. Deep fry in oil when ever needed & enjoy! a) Amount of water depends upon the quality of rice & sago,so keep some hot water ready while cooking the dough. b) Add chillies according to your taste. Pour water just above sago & leave it covered overnight. Next day grind salt,green chillies & hing to a smooth paste,keep it aside. Boil 4 cups of water,add the soaked sago into the boiling water. In medium low flame cook till the sago is transparent & semi thick like soup,switch off the flame. Now add the ground paste,jeera & squeeze out 1/2 of a big lemon,stir it well.Let it cool a bit,check salt if needed add more. Spread a thick plastic sheet in the sun. Take a spoon of the sago mixture spread it slightly.The thickness should not be too thin. Let it dry in sun the whole day,flip it over to the other side & dry the next day. 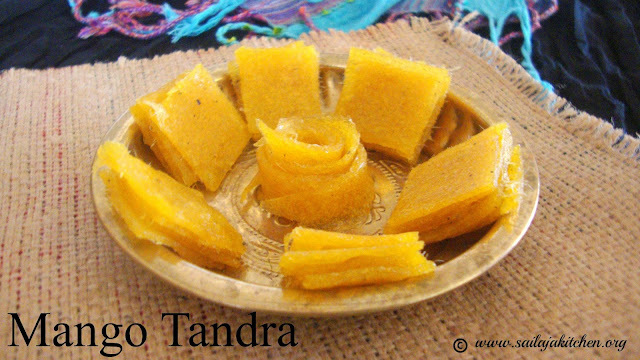 The 3rd day place it on a tray or plate & dry it completely.Store it in container. 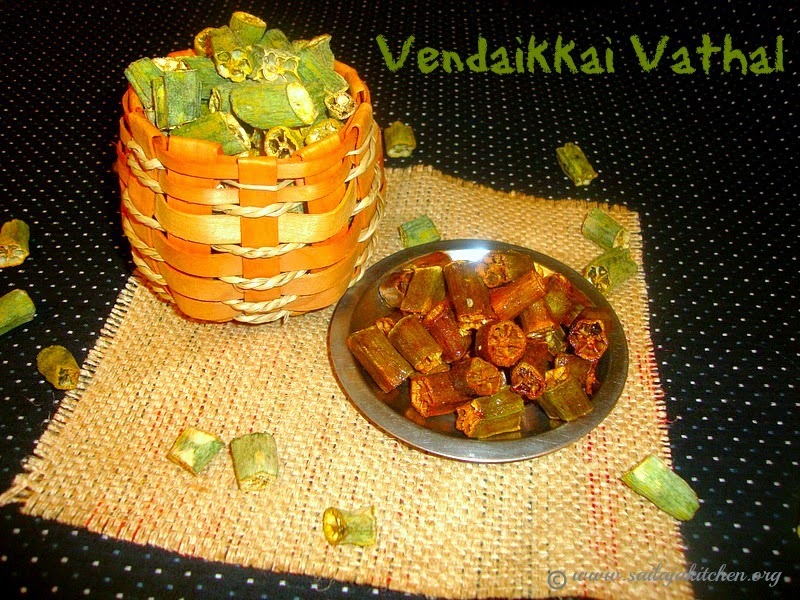 Deep fry these vadams in hot oil & enjoy!!!! Some add butter milk to the mixture to get a nice water colour. Add chillies according to the taste of your family. 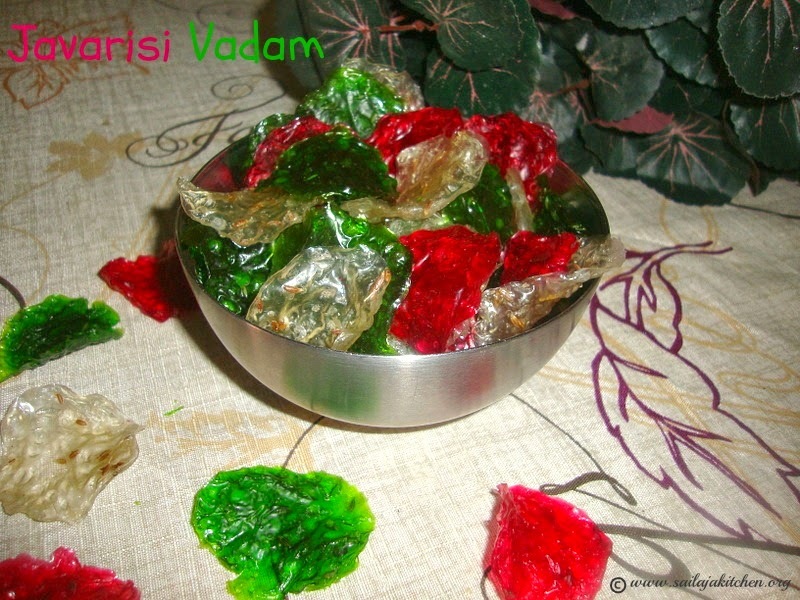 If you want colourful vadam,add food colour to the cooked mixture. Take a blender & grind cooled cooked sago,curd,salt,hing & green chillies to a very smooth liquid. Pour this in a bowl to this add the powdered aval & coconut oil, knead it to a tight dough. 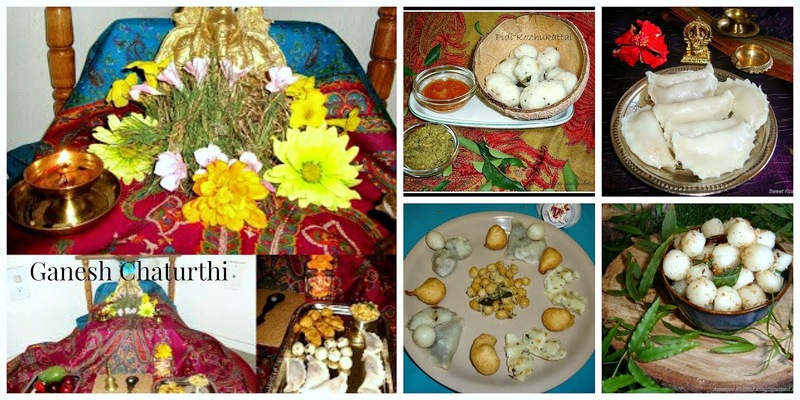 Take small balls,dust it with maida & roll it out into very thin small circles. 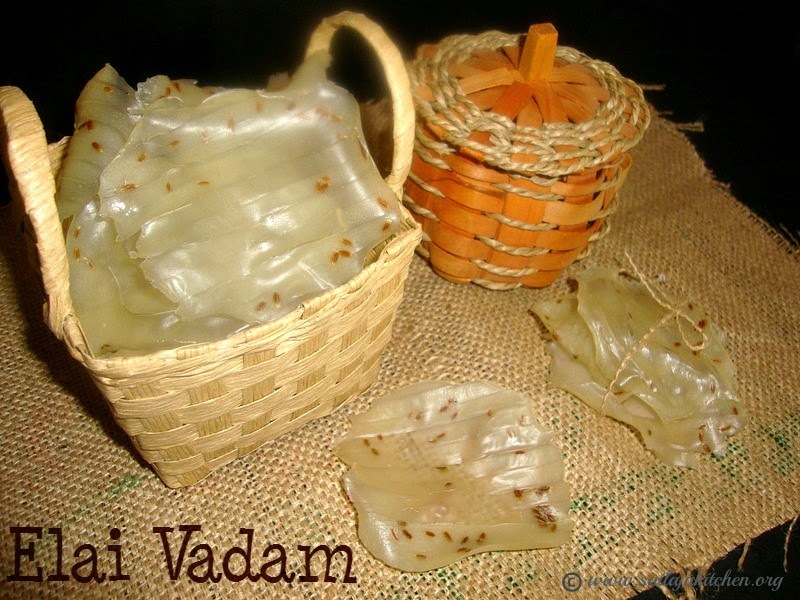 Place it on a plastic shhet or tray & dry these appalams in sun for 2 days or more till its completely dry. Deep fry in medium flame till crisp & light brown on both sides & enjoy! If you think your dough is a bit loose add some more aval powder to form a dough. 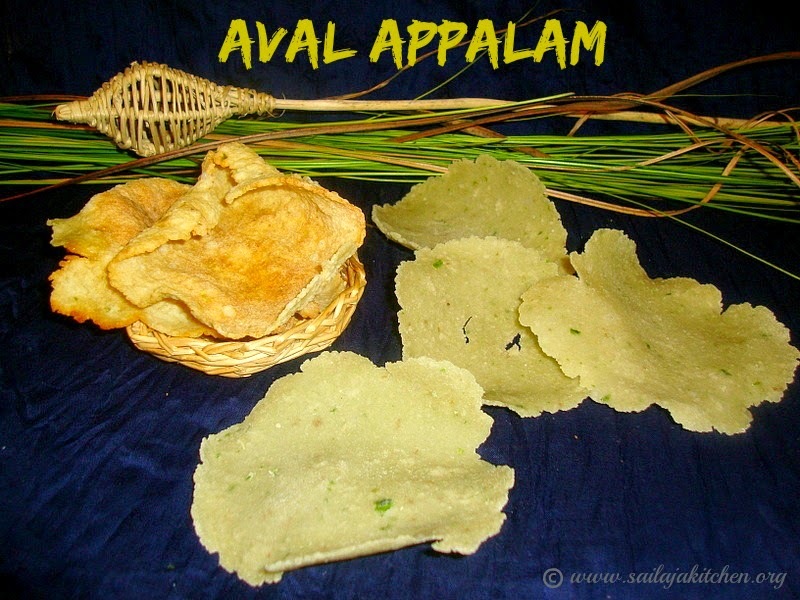 Deep fry these appalams in medium low flame till both sides are light brown & enjoy! Recipe from a TV show.